Greenan Electrical supply BBC, ITV Free to air systems with full installation. Free to air satellite gives you access to over 150 Free to air TV & Radio channels, all with 100% digital-quality picture and sound. There is something for every member of the family with Entertainment, music channels, news and a great selection of family programming channels. You'll get top quality picture and sound. Then sit back and start enjoying the incredible entertainment value available. Remember there are no monthly fees with Free to air satellite (Freesat). This is a one off payment there is no monthly charge, no viewing card or phone line is needed. 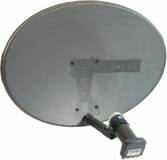 This is a Free to air dish and receiver package including standard installation that currently receives the following channels and many more. FreeSat also provides over 140 channels of digital TV and radio, contract-free, with up to 70 hours per week of free HD TV, from the BBC & ITV for a one-off installation charge. High definition (HD) gives you up to 5x the picture detail of standard TV giving richer, deeper, more life-like pictures, with stunning surround-sound putting you at the centre of the action. Your HD service is free on FreeSat, so you may watch HD programmes from the BBC & ITV. You will need a freesat HD digital box connected to an HD Ready TV.